Just 3 weeks until the DanceHouse season opener! Friday and Saturday November 13 and 14 the Vancouver Playhouse will be host to the Hofesh Shechter Company with the trilogy barbarians. Shechter’s choreography is at once charismatic and beautifully intricate, seductive and intelligent. 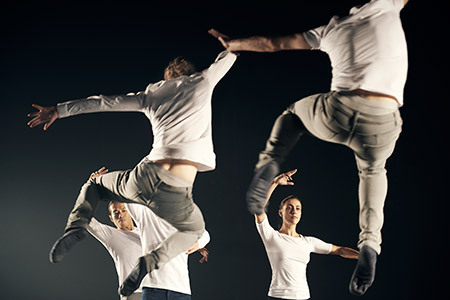 With barbarians, Shechter offers three distinct pieces imbued with his signature style. The complex beauty of baroque music inspires a sparse world in which dancers move with mathematical precision. A percussive score drives a fluid, almost urban movement vocabulary, inspired by groove and darkness. barbarians is an extraordinarily elegant and intimate offering from one of the world’s most sought after choreographers. The piece is on tour before it hits Vancouver, and is receiving some great reviews! At the Vancouver Playhouse, 8pm. Tix (but hurry – the shows sold out last time he was in town!) And we leave you with this video of the piece in the making. This coming Sunday October 25, as part of New Works Dance Allsorts program, get ready for an afternoon of dance featuring works performed by and created in collaboration with members of the Modus Operandi training program. The program includes a series of rapid-fire duets and features thirty (!) Modus Operandi dancers. These dancers are a small and determined group of rebellious thinkers and movers inspired by radically relevant philosophies and hailing from diverse backgrounds and points of view. You will not be disappointed! At the Roundhouse Community Centre, 2pm. Advance tix or at the door by donation. And if you want to try out some of what they do, a workshop follows the show 3:30 to 4:30. ~ by DanceHouse on October 23, 2015.